It’s the first Sunday of the month, when I typically feature student or newly-graduated illustrators. I actually featured a student last week (just because), and today I’m doing something slightly different. 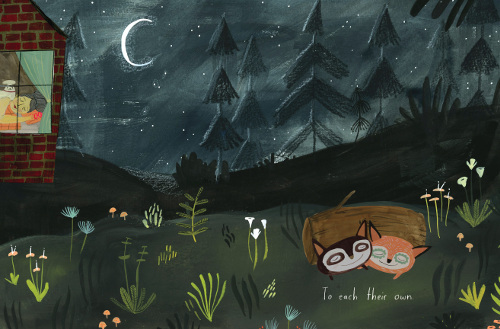 Back in September of 2014 (here), I featured the work of Esmé Shapiro, who had just graduated from the Rhode Island School of Design with her BFA in Illustration. 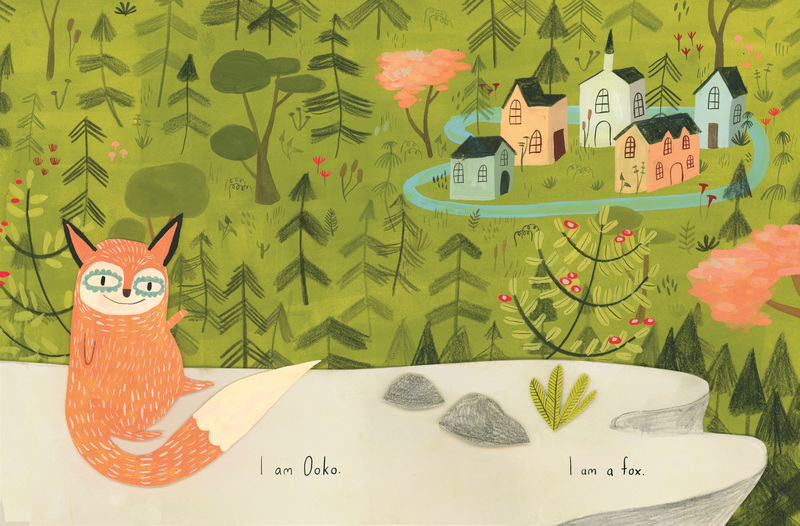 Esmé is now seeing the publication of her debut picture book, Ooko (Tundra Books, July 2016), so I thought it’d be fun to have her back. Pictured above is the cover. 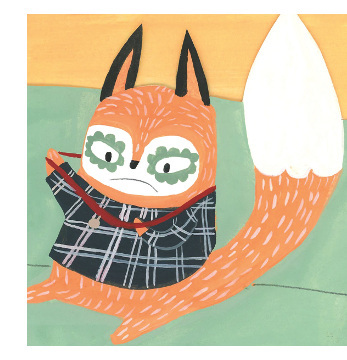 Ooko tells the grass-is-always greener story of a fox, named Ooko, who longs for a companion. Though Ooko tries hard to find one, there’s no such luck. One day, Ooko sees a girl playing with a dog. When her mother calls for her (“Debbie”), Ooko assumes all the humans are named Debbie. “I want a Debbie too!” Ooko decides. After spying on various Debbies and their pets, even trying to alter appearances for love, Ooko eventually ends up with a Debbie, an older lady with faulty glasses, who mistakes Ooko for her own pet maltese. Ooko isn’t very happy in this new home but escapes with a new friend, finally finding contentment. The Kirkus review calls the book “playful, joyous, and hip,” and the Publishers Weekly review calls Ooko’s world “a gloriously distinctive” one. Esmé: Oh my crickets! I am so delighted to be featured on Seven Impossible Things! 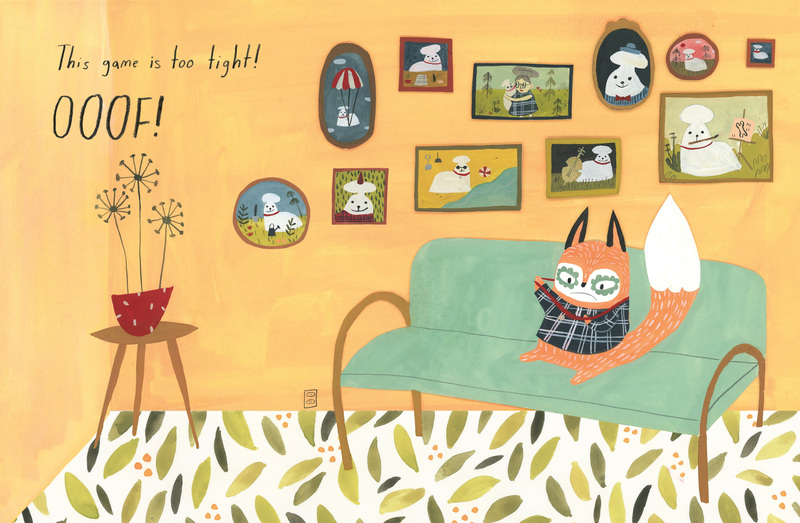 Last time I made an appearance on this blog, I was fresh out of RISD, and having my very own picture book out there was still just a dream. 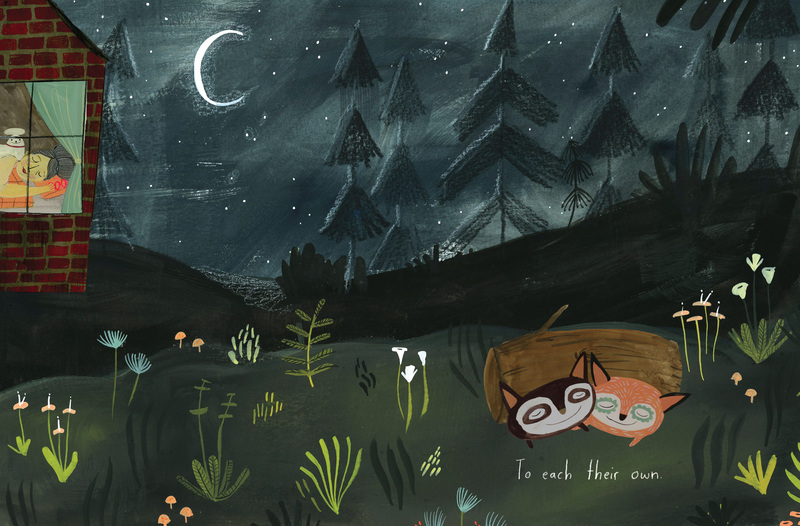 So to be able to share some spreads from my very first book, Ooko, is an honor. 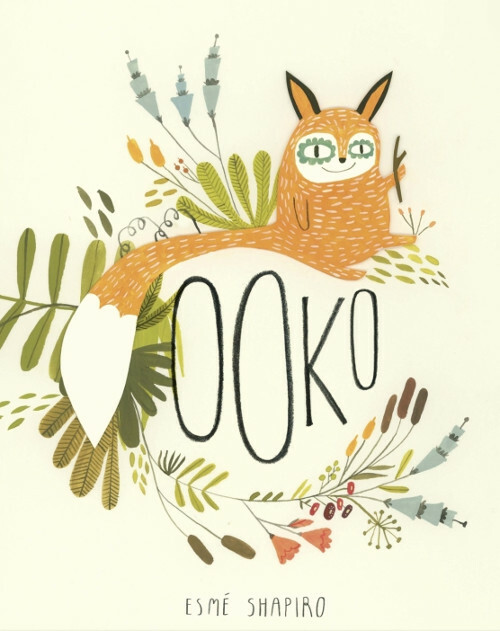 I should mention that Ooko was made using gouache, watercolor, colored pencil, and paper cut-outs. I painted the backgrounds first and then cut out the characters separately. This gave me the freedom to play around with the composition, and it made putting each spread together feel like a puppet show. [Above] is the very first spread in the book. In introducing Ooko to his readers, I felt it was important to establish his surroundings. A river separates the quaint neighborhood filled with Debbies from the wild woods and acts a visual marker between the two very different worlds. I made sure that Ooko, on the other hand, would be perched on a ledge above it all, waving mischievously, as if he is beckoning his audience to join him on his journey in finding a new friend in the strange world of the Debbies on the other side of the river. I love this spread [above], because each character is so lost in their own little worlds. Ooko is blissfully proud of himself, showcasing his new look that will surely score him the love of a Debbie. The Debbie he is destined for, though, seems completely unaware of Ooko as he prances through her garden. Her leg hairs are swinging in the breeze, and her puff ball of a hair-do seems like it should be bouncing up and down as she waters her garden full of various plants. All the while, Ruthie, the Debbie’s little maltese, is escaping! [Above] was the absolute most fun spread to do. Ooko seems so out of place in a world fit for Ruthie and her Debbie. With his too-tight collar and too-itchy sweater, Ooko is finding that maybe a Debbie isn’t the type of friend he is looking for after all. 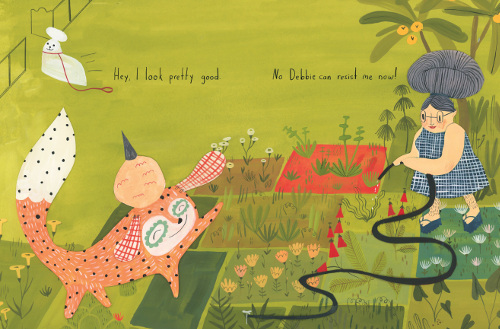 The paintings surrounding him make it painfully obvious that, while Ooko does not quite get along with his new companion, Ruthie is a dog whose life is made so much richer because of her hairy-legged Debbie. It was so fun to make these little paintings of Ruthie’s life, because I got to wordlessly dream up what her personality is like. I’d like to imagine that in her spare time, Ruthie takes college level courses online and listens to Jane Austen books on tape while she paints the sunset. Ruthie is also probably the kind of dog that likes to garden and read up on the farmers’ almanac to make sure she knows what seeds to plant for next season. I would also like to think that Ruthie is a playwright and perhaps acts in her very own dog plays — maybe one is called A Dog is a Rose by Another Name. Ultimately, through these tiny paintings, I wanted to make it clear that Ruthie loves her Debbie, and she is the most important part of her world. Perhaps Ooko will find a friend that he gets along with just as naturally, too. This last spread is in direct contrast to the first spread, because there is no longer a river separating the wild and tame worlds from each other. Ooko and his new friend are fast asleep, not too far away from Ruthie and her Debbie. This spread is very important because it suggests that, although we may be different and like different games and hang out with different folks, at the end of the day there are many things that still connect us. In this case, it is a good night’s sleep (unless you are Ruthie, because in that case you are probably wide awake plotting your next novel!). In any case, there is something about this page that makes me very sleepy, too. So goodnight and sweet dreams, Seven Impossible Things. Until next time! OOKO. Copyright © 2016 Esmé Shapiro. Illustrations used by permission of the publisher, Tundra Books, a division of Random House of Canada Limited, a Penguin Random House Company. 1) Visiting a dear friend this week. 2) Reading The Chronicles of Narnia with my girls. 4) Progress (some) with packing. 5) The way the girls leave such detailed notes on the outsides of the boxes they pack. 6) I finished Bone Gap, which was very good. Good morning, Imps! Happy July! Hello Esmé Shapiro! Ooko looks adorable. Jules: Yay for progress, and details. 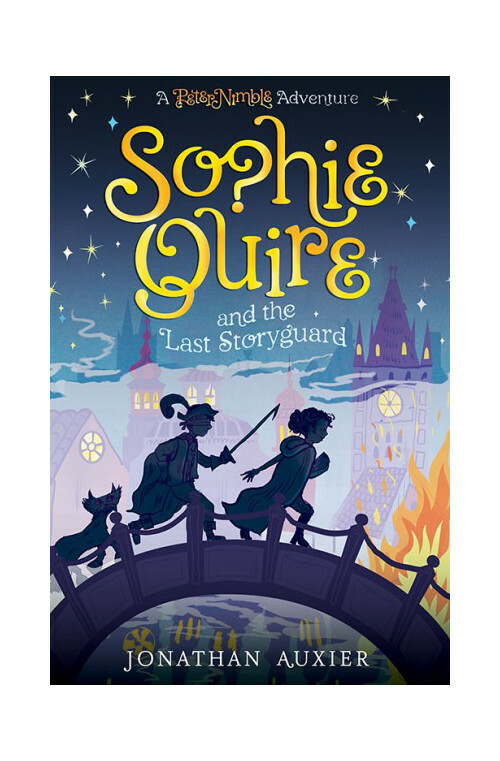 What a fun story & illustrations! Ooko is quite the character, but I admit I am intrigued by Ruthie and all of her adventures – the spread with all of the tiny portraits is my favorite! Jules – Hooray for packing progress, visits with friends, & the Chronicles of Narnia. LW – love all your kicks, but especially 5, 6 & 7. Nice is nice. 1) A surprise visit from a good friend I don’t see enough. 2) Planted daisies in the front yard yesterday – it’s starting to really come together. 3) A freshly bathed Daisy. 4) Finished “Code Name Verity” this weekend. Really loved it. 5) Finished “Walk Two Moons” as well, and loved it too. Did not see the plot twist coming until almost the very end, it was so well done. 6) Season 2 of UnReal. 7) Making travel plans for next year. Anticipation is a good thing. Hi there, this is a fly by as we’re travelling in Idaho. Happy 4th! I love this book , Esme! Congrats. LW: love opportunities and books. Rachel, will.be starting Code Name Verify. Off to Yellowstone on Tuesday. LW: Did you book a miniseries? !! Rachel: I picked up a copy of Code Name Verity at the library this weekend. Don’t know why I didn’t get it. I’ve been wanting to read it for a while. Thanks for this reminder. I’m going to head back there (especially since the grown-up novel I got is doing NOTHING for me). … Daisies are my favorite. I love the attention you give to growing things. Jone: Happy and safe travels! It’s very considerate of anyone traveling to even THINK of stopping by here!